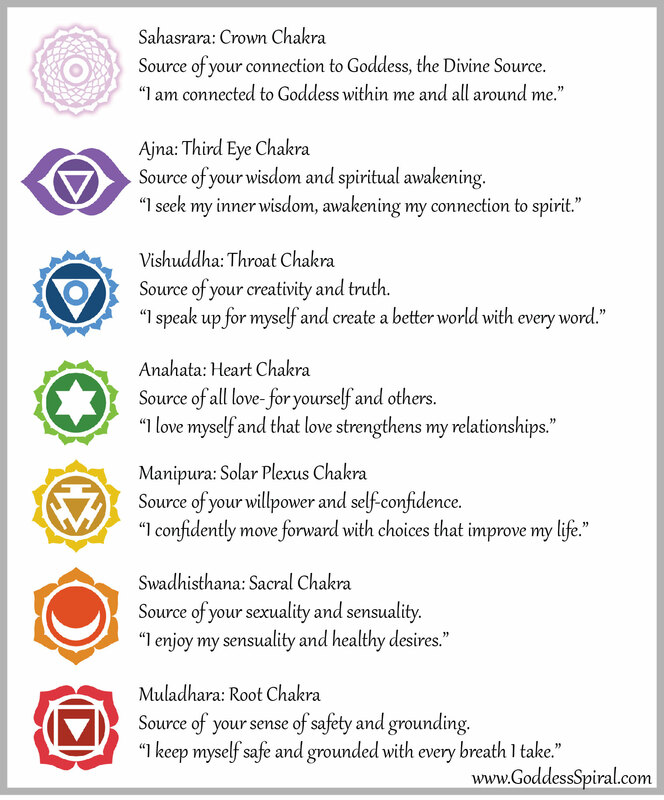 Chakra may now be a common term to you and you may even have an understanding of its meaning. The chakras (meaning wheel or cycle) are culmination points for nadis (channels) of prana sacral chakra(energy or lifeforce). A useful analogy when considering chakras is to envision nadis as highways, filled with cars (prana) and the chakras are the intersections and roundabouts where these highways meet. The chakras reside on the sushumna nadi, which is the central channel of energy that is aligned with the spinal column. Sahasrara means infinite or thousand and is represented by a thousand petalled lotus and is the place of ultimate illumination and self realisation. Here, you’ll find the pure consciousness, the source of light and the bridge to the Universal energy that connects us to the bigger picture. It is here where we discover detachment from illusion – that illusion that is often created by our ego self – that we’re not enough, that we need certain things to survive and all those pesky fears that keep us from seeing the bigger picture. It governs our ability to learn and gain knowledge and connect with a higher or spiritual realm. The crown chakra helps us to answer the bigger “why” questions and helps us discover where we fit into this Universe and it expands with every experience and new knowledge gained. Sahasrara is the seat of where all parts that comprise “you” come together; a complete integration of all parts and all chakras and should Kundalini reach this chakra it is believed that you will achieve the ultimate state of bliss. ‘The energy of all Nādīs flows together here, just as the water of a thousand rivers comes together in the sea.’ Read more here. This enigmatic chakra grants us new perspective and offers us a way of seeing things in a new way, unites us to our highest potential and provides us with inner direction. Our relationship with this chakra dictates our relationship with a higher being or the higher self. Its yantra is depicted by a full moon which symbolises the full bloom of consciousness, accompanied by an akatha triangle which sits the abode of Shiva (in the subtle and infinite form). 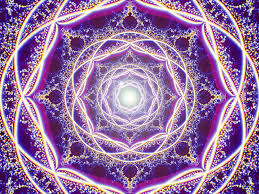 It is associated with a pure white light or some people visualise this chakra as a strong purple colour. It is said to hold no seed sound but that of a vibration of silence. As the lotus is rooted in the murkiness of mud and extends towards the light to blossom into something magical and beautiful, so too, do we. ‘In the Sahasrara Chakra exists an important power – Medha Shakti. Medha Shakti is a hormone that influences brain functions such as memory, concentration and intelligence. Yoga exercises can activate and strengthen Medha Shakti,’ Yoga in Daily Life.